Manage billing/shipping info and your previous orders via your Store Account. Manage your group, create/assign tuxes and more! Includes: Jacket, Pants, Shirt, Vest/Cummerbund, Neckwear, Studs & Cufflinks and a Formal Garment Bag. Create & Assign Tuxes to your Group, Track their Progress and More! Whether you're renting tuxes for two, ten or twenty - it's usually easier to just do it online. Customers usually don't believe us until we ask them how easily they can assemble their group of friends to a single location that they don't usually frequent. For most of us, that's easier said than done - and that's usually what has to happen when you rent locally. What Do I Need To Rent For A Group? All you need is a free Group Manager account, and the email addresses for your group members (or their parent/guardians in the case of children). The only caveat is that our group manager only works with complete tuxes built via our tuxedo builder (it works with coatless tuxes via the tuxedo builder as well) - however, this works for most of our customers and is typically a non-issue, but is worth mentioning. How Does Group Tuxedo Rental Work? In a nutshell, you create an account, add your group members (by typing in their names and email addresses), then designing your tuxes and assigning them to your group. You can also design and save your tuxes first, and create your members / assign your creations later. We put quite a bit of freedom-of-choice into our system so that you can approach things in an order that makes sense to your and your needs. 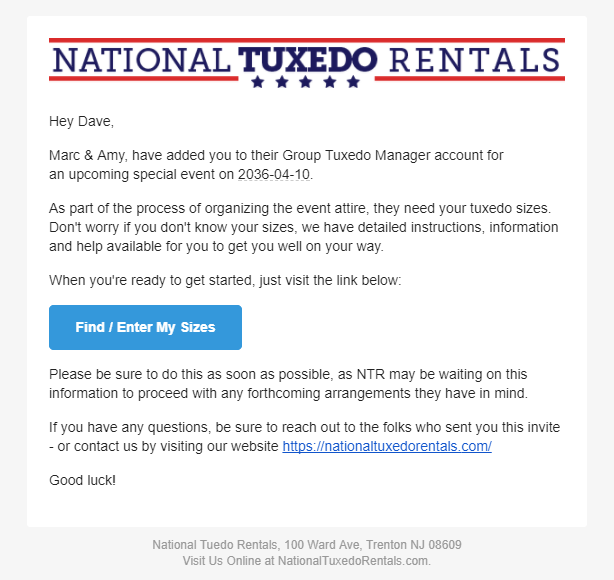 Once your group has been assigned their tuxes, you'll send out a size request email to your group - which can be done with the click of a button on your Group dashboard. From then, your group members will each receive an introductory email with all of the instructions they need to get started. After entering their sizes, folks will be able to add their tux to their cart and checkout (if they're paying for themselves). Alternatively, you'll be able to track everyone's progress. You'll get an email any time someone enters their sizes as well as again when they place their order. What if Someone Needs Help? Everyone in your group, including you, has access to our online chat service where our friendly support representatives are ready to help you. Additionally, you have 24/7 email support to ask questions, and because everyone's styles and sizes are saved safely to your group account, their information is kept safe no matter what. Finally, because you control most of the aspects of your group, and only you can decide what someone wears, we have virtually left no room for error on your group members behalf. This article was posted on Sep 05, 2017 . Now The Groom Rents Free with only 4 Additional People! Returning Customers: Use Sizes from a Previous Order! This is Why We Deliver Tuxedos 7-10 Days Early. Check Status, Track Shipments, Exchange Items & More! I don't know my order number. Enter your email address and we'll send you a copy of your most recent order confirmation email. Great, we see order # in our system. Identity Confirmed! Click below to begin submitting your sizing updates. Identity Confirmed! Click below to begin your exchange. Enter the email or billing zip code associated with your order.